November 15, 2017, Fort Worth, TX – W. Bradley Parker of the Parker Law Firm in Bedford has been named the 2017 recipient of the H.G. Wells Outstanding Trial Lawyer Award by the Tarrant County Trial Lawyers Association (TCTLA). The award will be presented on November 15, 2017 at the TCTLA Annual Meeting. Past recipients include John Jose (2016), Steve Laird (2015), Kevin Byrne (2014), Darrell Keith (2013), Jenks Garrett (2012), Hal Monk (2011), Art Brender (2010) and David Broiles (2009). 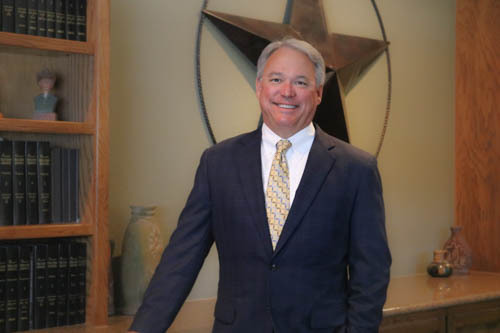 Parker has practiced personal injury trial law since he was admitted to the bar in 1985 and is board certified in Personal Injury Trial Law by the Texas Board of Legal Specialization. He is a member of the State Bar of Texas, the American Association for Justice, the American Board of Trial Advocates, the Texas Trial Lawyers Association, the Tarrant County Bar Association and the TCTLA. Parker received his bachelor’s degree in Government from the University of Texas at Austin and his J.D. from Texas Tech University School of Law. Parker is an AV®-rated attorney, the highest rating awarded by Martindale-Hubbell Peer Review Ratings. Parker has also served as Tarrant County Bar President (2010 – 2011); President of the Texas Trial Lawyers Association (2013); President of TCTLA (1999); and served as Panel Chair, District 7A Grievance Committee of the State Bar of Texas (2006 – 2008). TCTLA is a professional association comprised exclusively of attorneys whose primary area of practice is representing injured families in the civil justice system and is dedicated to the preservation of the right to trial by jury. The H.G. Wells Outstanding Trial Lawyer Award shall be presented annually to an actively practicing trial lawyer who is primarily engaged in the representation of injured and damaged plaintiffs in personal injury and other civil litigation and who, in his or her legal career, has demonstrated high ethical standards and has demonstrated exceptional professional conduct and trial advocacy skills and accomplishments, thus enhancing the image and reputation of the plaintiff trial lawyer. This award is to be presented in honor of H.G. Wells (1933-2008), a gifted, talented, gentlemanly and widely respected Fort Worth plaintiff’s trial lawyer, founder of the Wells, Purcell & Kraatz law firm, founding member of the Fort Worth Chapter of the American Board of Trial Advocates in 1983, former TCTLA President in 1977, former member of the State Bar of Texas Grievance Committee, former member of the original Texas Board of Legal Specialization for Personal Injury Trial Lawyers, and former member of the Texas House of Representatives from 1959 to 1965.